I have found that our GreenFriends Greenbelt Restoration Project has provided me with seemly endless opportunities to practice life lessons and spiritual practices such as persistence, flexibility, being in the moment, surrender, impermanence, non-attachment, equanimity and letting go. When I think of letting go, I think of the title of a book that I purchased in the mid-80’s, Life is Goodbye, Life is Hello: Grieving Well Through All Kinds of Loss. The title reminds me that loss is inevitable and it often, if not usually, leads to grief. I know that grief includes anger and fear as well as sadness. I believe that every ending brings with it a new beginning and that it becomes easier for us to let go as our faith grows; e.g. faith in God, faith in ourselves, faith in others. As I reflect on letting go, I also remember that I wrote 23 Affirmations for Letting Go in 1994 and shared them in this blog in March of 2014. To see those affirmations click here. I knew early on that the reforestation work would give me many opportunities to practice letting go. In my initial Forest Steward training, the students were told that we should be prepared to lose 30% of the trees, shrubs and ground covers that we plant. The thought of so many plants dying was totally unacceptable to me, but I also realized that I have no control over the weather and very little control over disease. A forest is not like a garden that you can keep well watered; the amount of water that the plants receive is determined by the weather. I did have some control over whether the plants were planted properly and stayed free of invasive blackberry, ivy and bindweed vines. And I could give them my attention and my love. My job would be to put in the effort and let go of the results. Just before we did our first tree planting in November of 2017, our GreenFriends group performed rituals asking Mother Nature for permission to plant and requesting that she protect and nurture everything we planted. We didn’t lose anywhere near 30% of our initial planting. In fact, during this summer’s long drought, only one of the trees died and almost all of the shrubs and ground covers grew substantially. While I have experienced lessons in letting go throughout the project, November 2018 seemed to bring more of them than ever before. Before I tell you about some of those events, I will share a bit of back story. In April of 2018, I decided we would clear some of the invasive vines on Cheasty Boulevard, the street on the east side of our site. As I walked down the road looking for a place to start, my eyes fell on some gigantic cottonwoods hidden among dense blackberry and ivy vines. I thought that was a perfect area for us to begin the new endeavor. On April 27, a corporate group from DocuSign came to work on our site. We divided the participants into several groups with each group having a team leader. One group worked on freeing those cottonwood trees from the invasive vines. In the months after the work party, I enjoyed walking down Cheasty Blvd. to visit the trees. They were so big and majestic. The photos above don’t accurately reflect their height or their width. 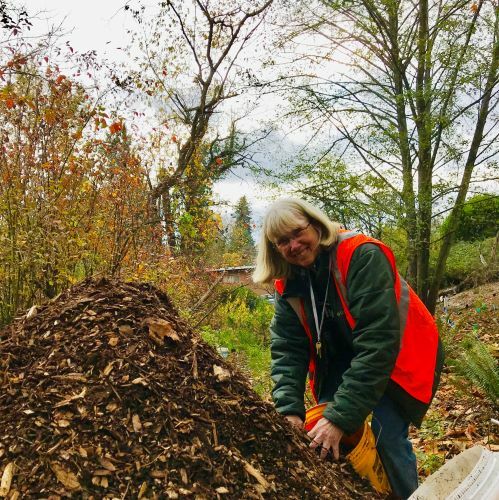 Then, on November 5th, I received a notice from one of the Green Seattle Partnership staff saying that a number of cottonwood trees on Cheasty Blvd. were going to be cut down. Tests had been done that showed the trees were hollow and had significant decay in the lower part of the trees and roots. If they fell, they would be dangerous. I had a sense that some of the trees that were to be removed were “my trees” so I walked down the Hanford stairs to look. Two of those trees had big R’s written in white chalk on the trunks which confirmed my fear. I was not surprised though. The trees were very old and one had a big fungus (Ganoderma) on it, which is also a sign of decay. My lack of surprise was also because in July, a smaller cottonwood tree had fallen across the road. I say smaller but it was still very tall; tall enough that when it fell, it took down the power lines on the far side of the street. When I looked at at the remains of that tree later, I had seen that it was hollow. So even though I was sad that the big cottonwoods were going to be cut down, I understood the importance of the act. Safety was of primary importance. It was much easier for me to accept this situation and let go than it might have been in a different circumstance. The person in the basket not only cut off the top portion of the tree, he/she also cut off most or all of the branches . At one point during the day, my whole house shook. I thought that must have been caused by one of the tops falling to the earth, or was it a whole tree? I thought it was curious that several of the largest trees were left standing. I later found out that Seattle Parks Department will be finishing the job. The next day, I walked into the Greenbelt, as I do most days. When I arrived at our eastern planting areas, I was horrified to see that the top of one of the trees was covering all of one planting area and part of another. I had never considered that as a possibility. There didn’t seem any chance that our plants could have survived such an event. I knew it was another letting go opportunity, but this one wasn’t going to be easy, I was way too attached. When I looked closely, I could see one of the trees through the branches. I walked back to my house to get a pair of hand clippers and cut away some of the branches. I could tell that the tree was going to be okay. We had a work party scheduled for the next day. It was obvious that we would need to let go of at least part of our plans for the work party. I didn’t know how we would manage to move the big branches but that wasn’t the task for the present, dealing with the smaller branches would be the first step. I called Andrea, one of my Green Seattle Partnership supervisors. We talked about what had happened and she agreed we could remove some of the small branches but said we would need to be sure none of the ones that were holding the tree off the ground were cut. We didn’t want to chance anyone getting hurt. Andrea mentioned that some Parks Department staff would be coming later that day and would take a look at the situation. When I walked down to that part of the site that evening, I was astounded by what I saw. The Parks Department staff had indeed come. They had cut up all of the branches and had stacked them neatly out of the way. I soon discovered that not a single plant had been injured by the falling tree or by the staff’s work. In fact, the planting areas were neater than they had been before the event. The branches, and the trunk that had fallen outside of the planting area, would decrease the chance of erosion and would become a home for insects and other wildlife. What an experience this had been. I felt like I had been on a roller coaster. I had been willing to let go, but not until I put in the effort to do what I could do to save the plants. I had also been willing to let go of the plans for the work party so we could do things that were more important. In the end, the plants were fine and we were able to return to the original work party plan. My faith in the support that is available from Green Seattle Partnership and the Seattle Parks Department had grown. As I reflected on the incident during the next few days, I remembered the rituals we had done asking Mother Nature to protect the plants. My faith in that process also grew. One morning during the next week or two, as I was waking up, I was pondering how I would write this post. When I got out of bed and checked my email, I received another shock, and another letting go opportunity. Again, the challenge was related to the Greenbelt reforestation work. But that is a story for another post! Greenbelt Restoration Site: We Are Almost Ready! We’ve been preparing for our first 2018-19 season planting day for months. We’ve done that by 1) putting a three inch layer of wood chips on the paths that run throughout the site, 2)clearing new planting areas, and 3) weeding the existing planting areas. In mid October, I started making “plant signs” by writing the name of each plant we had ordered from the Seattle Parks Department on a Popsicle stick. The “signs” would be put into each of the pots once we received the plants. After each tree, shrub or ground cover has been planted, the volunteer who does the planting will push the sign into the ground next to the plant. Each year, flagging tape is used to tag the plants so we know what year each of them was planted. Blue and white checkered tape was used throughout the 2017-18 planting season. During the 2018-19 season, the tape will be red with black polka dots. This year’s flagging tape was chosen by a group of children! The normal practice is to tag each plant after it is planted. This year, we are going to put the tape on the plants before the planting day. That will ensure that each plant is tagged and will allow the us to tag the plants in a more leisurely manner. Small plants are often not able to be tagged in the same way as the larger ones, since they may have fragile or tiny stems. In the past, we have picked up a dried branch from the ground and put the flagging tape on one end and then pushed the branch into the ground near the newly planted plant. This year, I decided to prepare the flagging sticks ahead of time too. It occurred to me this was also a way to put the small but sturdy branches that are in our debris piles to good use. A fellow student in my Tai Chi class gave our restoration site three cedar trees he had raised. Those were the first trees I tagged. Our plants arrived on October 30. When they were delivered, they had no labels and were not sorted. It was a lot easier for me to sort the plants this year than last, since I was more familiar with the plants. I sent photos of the varieties that I wasn’t sure about to Jayanand, a plant ecologist friend who lives in Pt. Angeles. 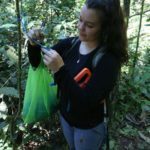 Soon, all of the plants were sorted and ready to be tagged. After our October 21st work party, Sarva, Anavadya and I picked out locations for the 33 trees we will be planting. Sarva and I also met on November 4th to decide where most of the shrubs and ground covers will go. The other thing that happened on November 4th was that Kavita performed a puja asking Mother Nature for her blessing, to protect and help the new plants to grow. We already have 37 volunteers registered for our November 10th work party. On that day, we will finish preparing the site for planting. After that work party, Sarva and I will put the plants on the spots where they are to be planted; and on the 12th or 13th, Anavadya and I will distribute the 95 plants that don’t have a designated space yet. Then, on November 15th, most or all of the trees, shrubs and ground covers will be planted by DocuSign employees, a corporate group. This is such an exciting time of the year. Each year, the Green Seattle Partnership sponsors a Green Seattle Day. On that day, work parties are held in parklands all over Seattle. Sarva and I decided to volunteer as team leaders at Cheasty Mt. View Park. Several other GreenFriends members and their friends joined us. The number of people who registered for the work party amazed me. There were seven in our GreenFriends contingent, but 126 volunteers in the whole group. One of the leaders encouraged the participants to plant from a place of gratitude. She suggested that the volunteers name their trees … and that they talk to the trees as they put them into the earth. As I wandered through our section, helping people with the planting, I heard many participants doing that. After some of our GreenFriends group planted this tree, they decided to give it a kiss. The 126 volunteers planted 800 trees, shrubs and ground covers during the first hour of the work party. We spent the rest of the work party removing invasive blackberry and ivy vines. Again, it was phenomenal to witness how much can be accomplished in a short period of time. We put vines we cut onto drying racks so that they don’t touch the ground and re-root. There were several drying racks in the area where we were working but they were soon full. Before long there were big piles of cuttings around the site. Some of the volunteers built a new drying rack and then we moved the piles of cuttings to the new rack. Before long, the three-hour work party was over and we prepared to leave.